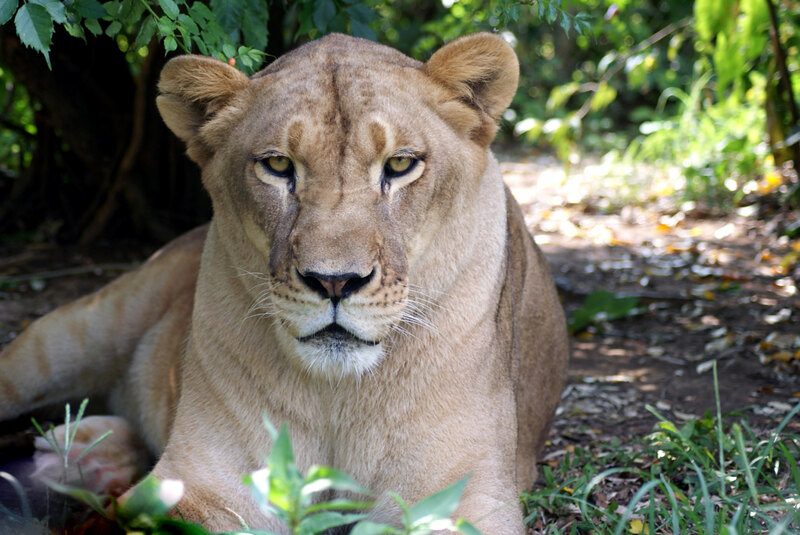 Reina is a spirited and energetic lioness who best resembles what you would see in the wild. She thinks she is super sneaky and most of the time she is. 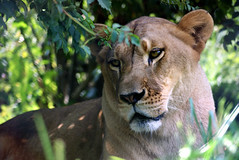 It is amazing that such a large animal can hide so well right in front of you! 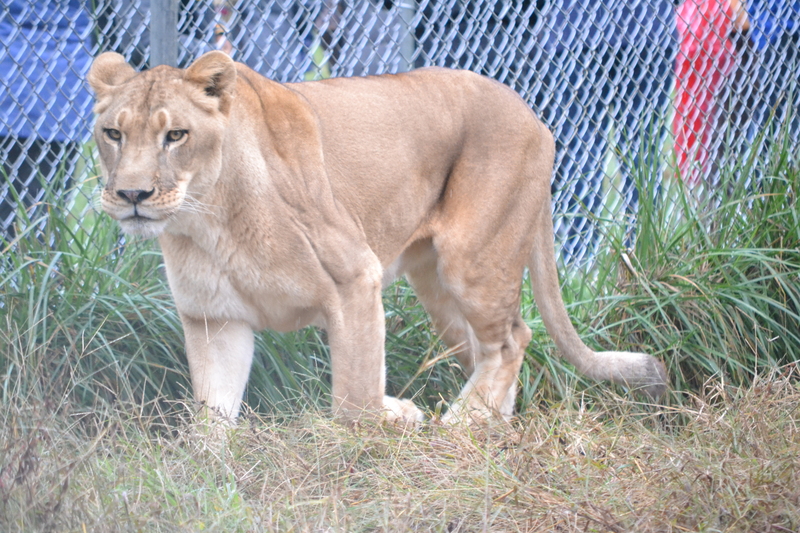 Reina loves chasing trucks up and down the road as they go by. 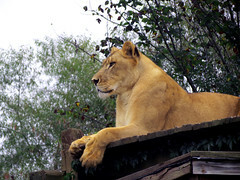 When she is not chasing trucks, she can often be seen lying atop her denbox overlooking the sanctuary. 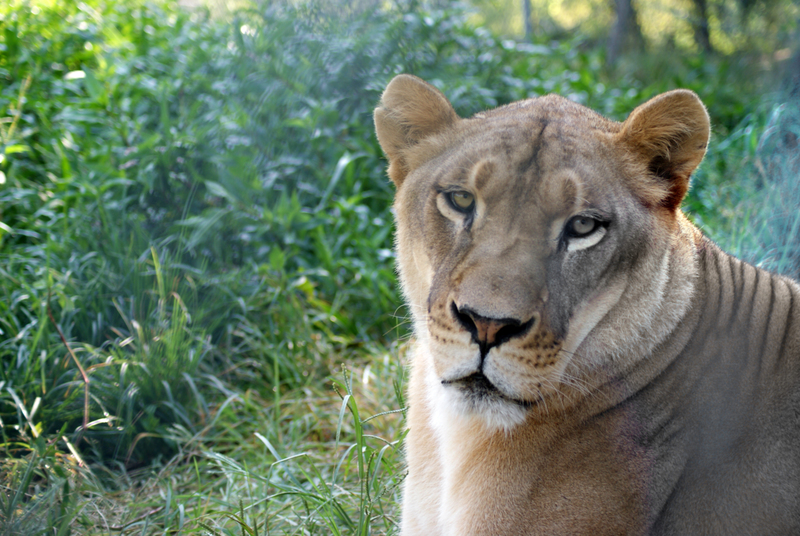 Reina came to Carolina Tiger Rescue along with her enclosure-mate, Roman, from a failing rescue in Ohio. 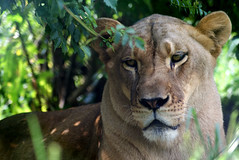 This sanctuary, Rescue One, was on the verge of closing due to lack of funding and new legislation the state of Ohio put into place after an incident in Zanesville, Ohio in 2011. 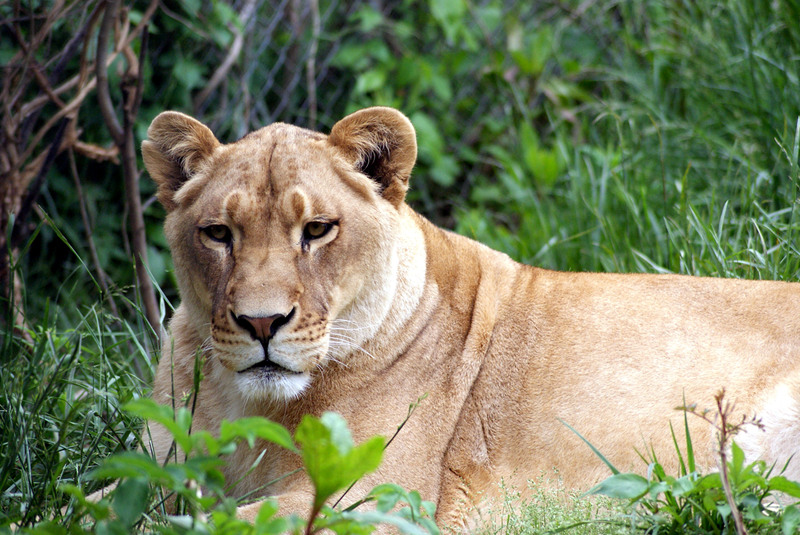 In Zanesville, a private owner released 56 of his lions, tigers, cougars, wolves, leopards, and bears before committing suicide. Unfortunately, law enforcement was forced to shoot the animals due to concerns for public safety. 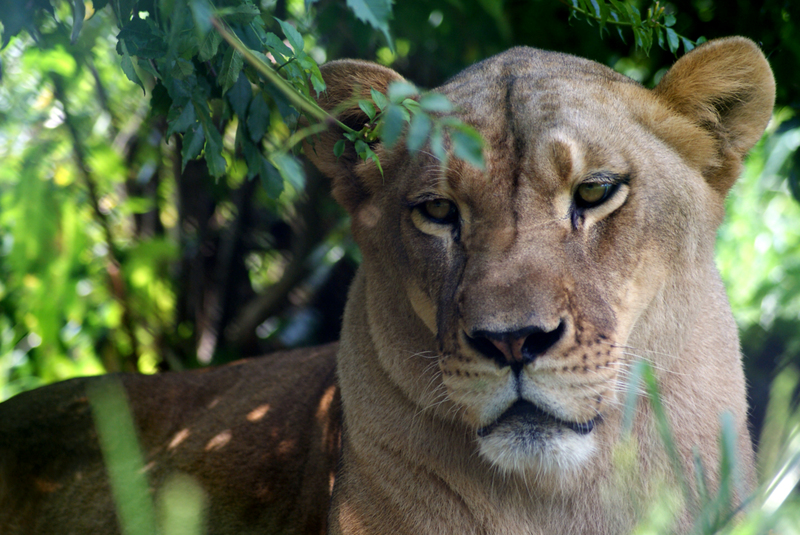 The following year, Ohio banned private ownership of dangerous wild animals. 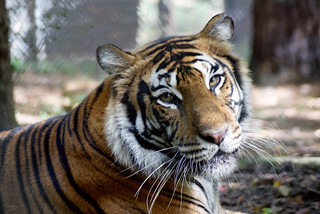 The owner of Rescue One decided to close on her own and contacted Carolina Tiger Rescue to take some of her animals. 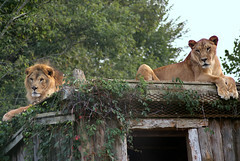 Carolina Tiger Rescue rescued Roman and Reina Lions, Roscoe and Camilla Tigers, and Nakobi and Jericho Cougars in 2012. 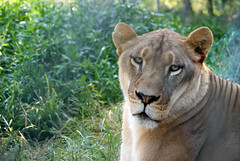 Reina is a very serious lion who is only submissive to Roman, which is the role of the female lions in the wild. 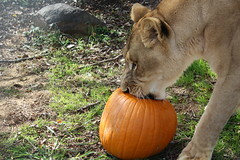 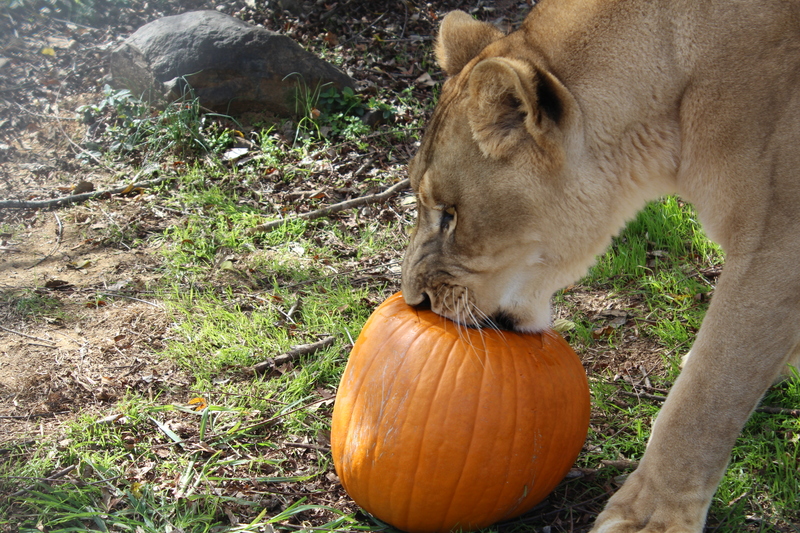 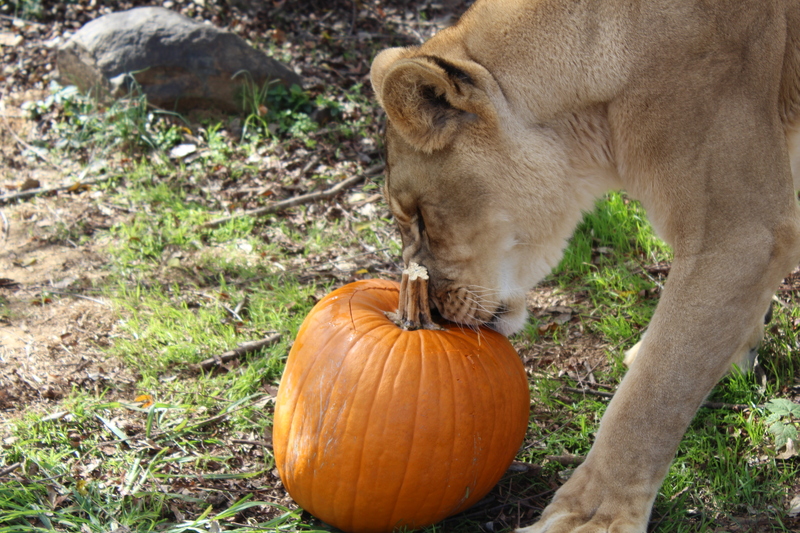 Reina, however, does like to have fun and is often the first of the two to attack enrichment and play with a ball or pumpkin that has been given to them. 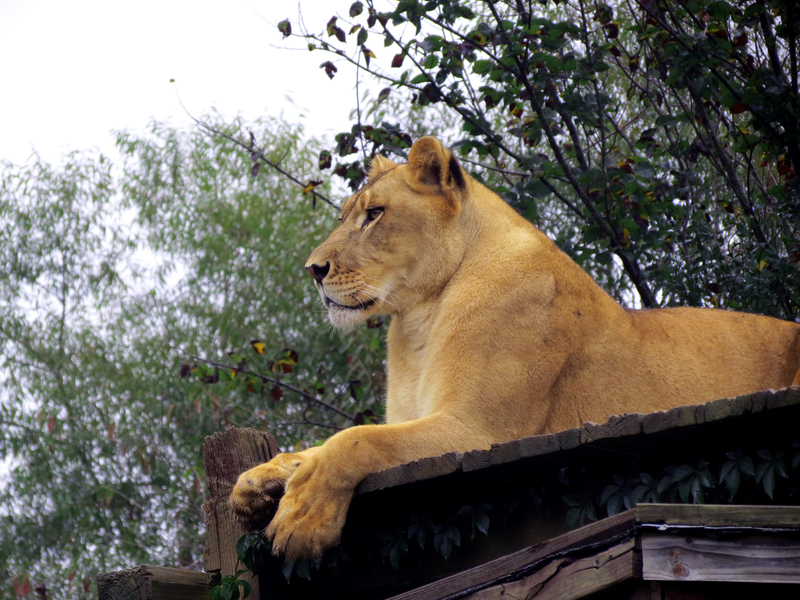 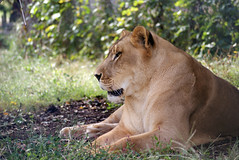 Reina is a large lioness and is actually slightly larger than Roman, the male lion she lives with. 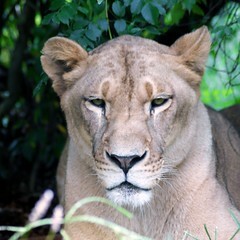 Reina has the typical tawny fur and looks as though she would be right at home out on the savannah with her wild cousins. 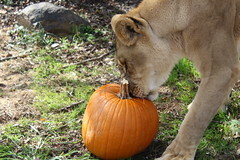 Reina lives on tour on Oak Hill with Roman Lion. 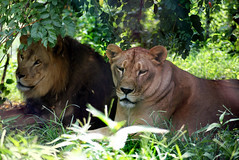 Their enclosure is flanked by the other pride of lions, Sheba and Sebastian, on one side and Rajah Tiger on the other. 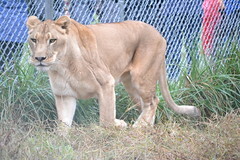 Before being rescued by Rescue One, Reina and Roman were involved in "cub petting". This is when the public is able, typically for a fee, to take pictures with and play with baby wild animals. 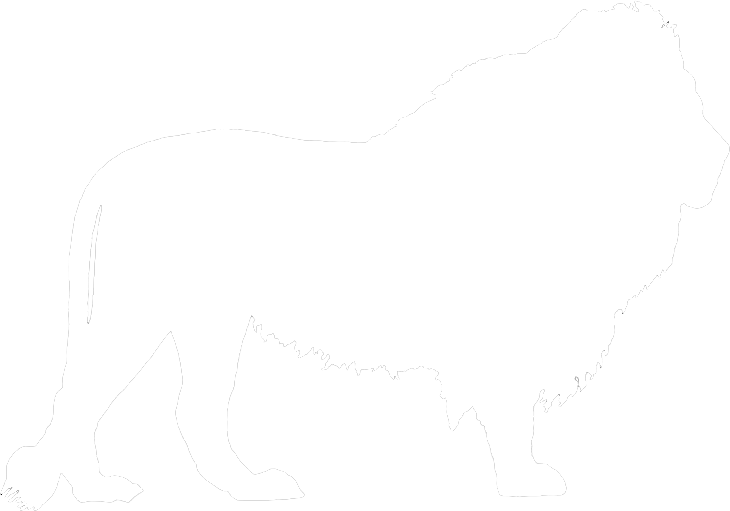 This is a huge detriment to the animals involved. The cubs that are used for "cub petting" are taken from their mothers within days of birth so they do not imprint on their mothers and so their mother will go back into heat and can have more babies sooner. 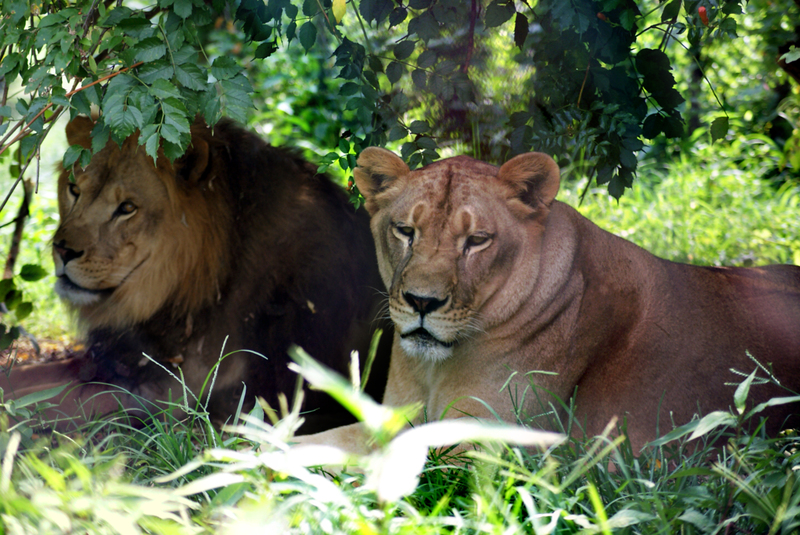 These cubs are also often sedated to prevent them from being too playful with the public. 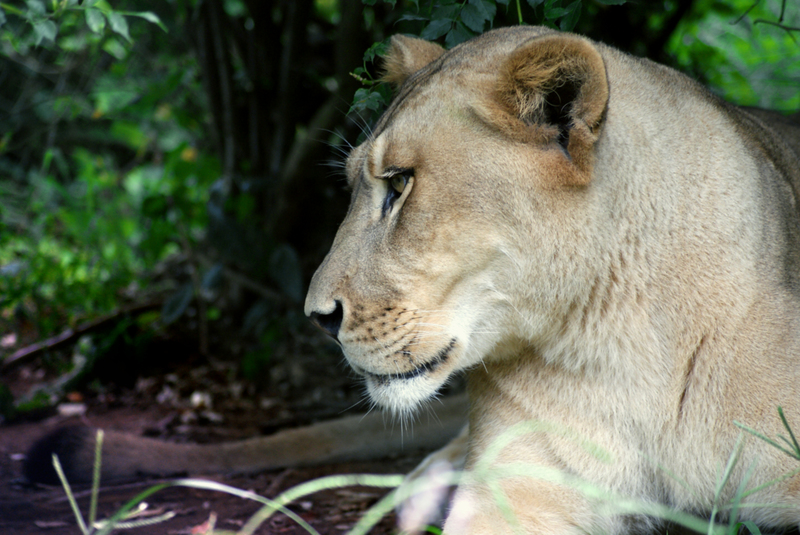 A playful cub can often inflict harm on a human unintentionally, as they have sharp claws and teeth. 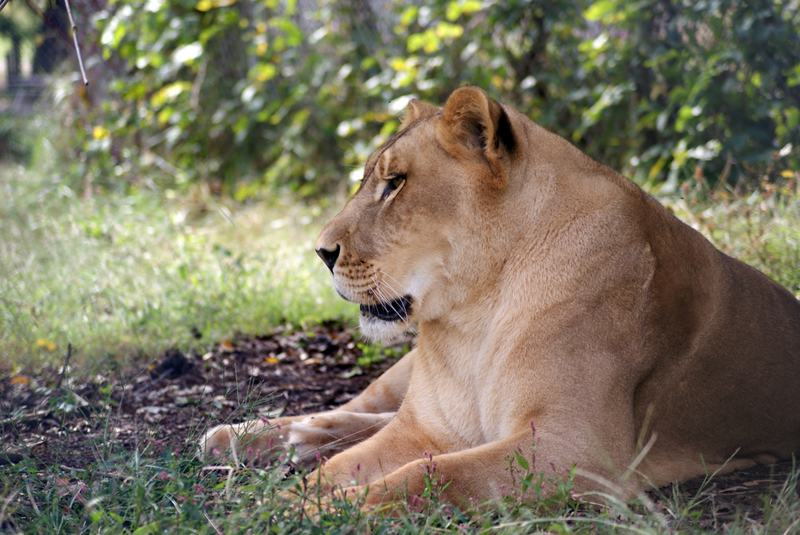 These cubs are also underfed to keep them small and to keep them hungry so they will be interested in the bottle of milk the public usually holds to keep the animal still on their lap. 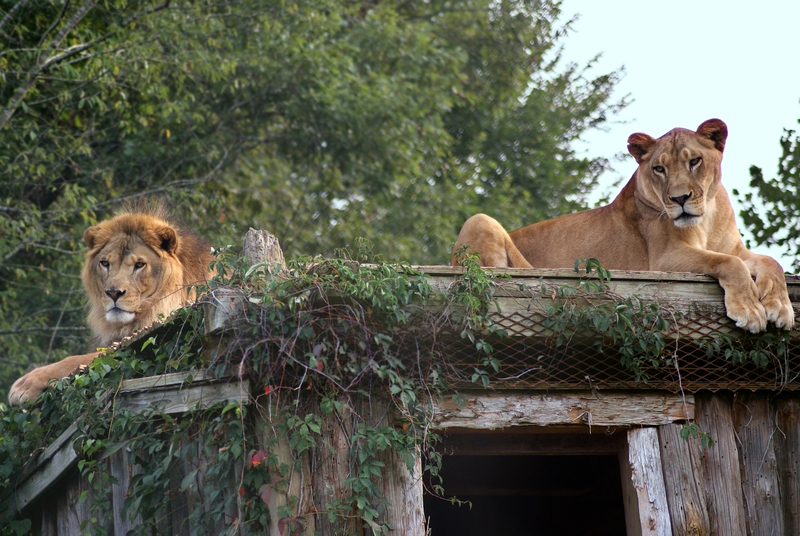 These cubs can only legally be used for the first couple months of their lives then they are deemed too dangerous, which leads many of them to be destroyed, sold into the pet trade, or sold to roadside zoos.